It wasn't previously thought to be a particularly important issue in the 50-year career of Marvel's friendly neighborhood wall-crawler, but 1990's Amazing Spider-Man #328 has ended up in the history books - and it's all because of the cover. 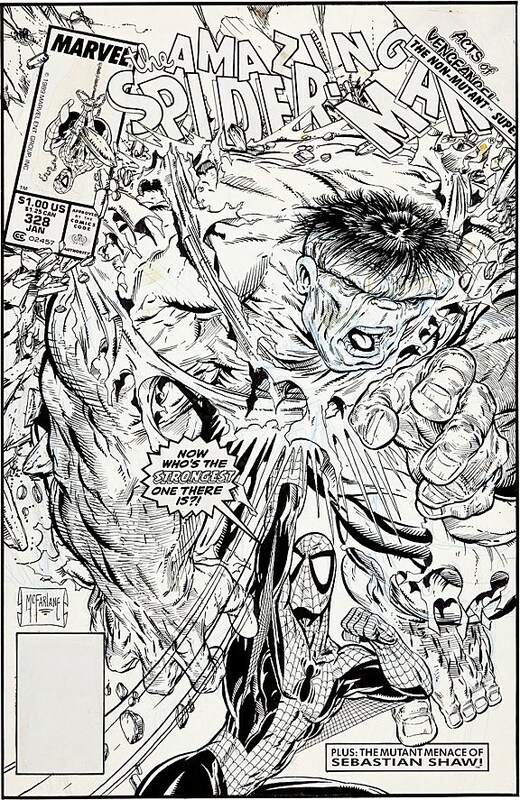 Well, it does feature Spidey punching the Hulk.Heritage Auctions announced yesterday that it had sold Todd McFarlane's original art for the cover of ASM #328 for a staggering $675,250, making it the most expensive piece of original American comic art ever sold. The previous record holder was page 10 from the third issue of Frank Miller's The Dark Knight Returns, which had gone for $448,125 in March 2011; both, however, are significantly cheaper than the record holder for the most expensive piece of comic art in the world, the original cover for 1932's Tintin in America by creator Herge, which sold for $1.6 million in Paris last month. The piece comes from the collection of Martin Shamus, the owner of a comic store on Long Island who is auctioning off his collection of late '80s and early '90s original art through the auction house. "The auction is on track to break $9 million and become the single highest grossing comic and comic art auction in history," Heritage VP Todd Hignite said in a statement about the McFarlane sale. "We're thrilled with the results and especially thrilled for Martin Shamus, who had the foresight and good taste to acquire these pieces more than two decades ago." It's not clear exactly what made this Spider-Man cover so particularly enticing for buyers that the price went so high; is it the chance to see McFarlane's Spidey and Hulk on the same page, with their traditional roles reversed and the use of a famous catchphrase? Is it the shattered logo (always fun to see)? Or maybe, whoever bought it just really, really liked the 1990 crossover "Acts of Vengeance."